I happy to receive my April Birchbox Madmen New York Edition, which I chose over the Madmen LA Edition!! Although both boxes have great goodies, I gotta represent East Coast ( I am born and raise in Virginia)!! Ok, focus!! And just in time to use for the 6th Annual Second Chance Prom that benefits Lynchburg Project Lifesaver and Commonwealth Autism last weekend!! 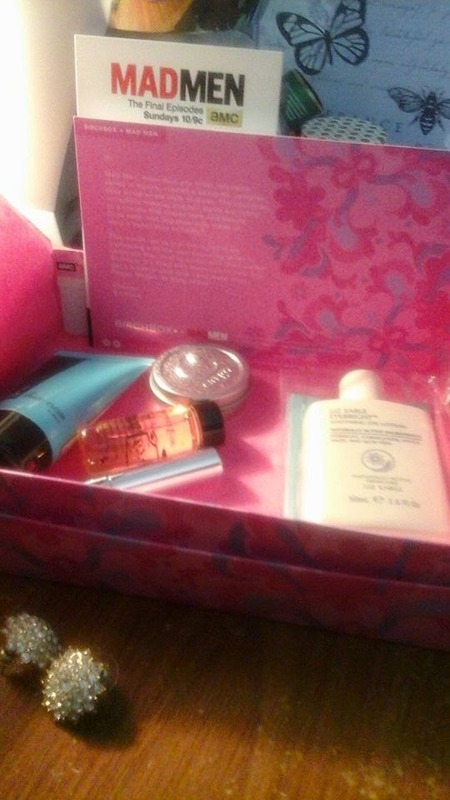 I love the Birchbox in their box designs and this one is in my favorite color, PINK!! I think I can upcycle this month's box! Love the how they packaged my goodies as well (see below)!! On Friday evening before Second Chance Prom, I shaved using Whish Shaving Cream! I am not a big fan of blueberry scented bath products, Whish left my shaved areas smoothed and conditioned which I am glad because I have dry skin! Plus, Whish has shea butter in its shaving cream!! After shampoo and conditioning my hair, I used only palm size amount of Beauty Protector Protect & Oil as pre-blow dryer treatment before I begin blow drying my long relax hair!! I was impress with the results of my hair with blow-dry with a straightening attachment!! I used one more drop on my ends before covering my hair in nightcap!! And I got plenty to spare for the evening of Second Chance Prom, too!! On Saturday evening of Second Chance Prom, I put on my makeup with included using Cargo Blush in Los Cabos (which is a peachy-pink shade)! Also, I used Anastasia Beverly Hills Clear Eye Brow gel on my Brows and nothing else on my dark brows which also has conditioning agents and didn't make my eye brows "stiff nor flaky"!! And to enjoy Second Chance Prom!! Once I got back home after a wonder evening of volunteering at Second Chance Prom, in which my makeup (Cargo and Anastasia) performed very well! I removed, cleansed, used toner, and then used the Liz Earle Eye Lotion on my tired eyes!! WOW, my eyes felt refreshed without any irritation and finished with my night facial cream!! I personally give all "5 out of 5" for this Birchbox Madmen NYC April box because all 5 items worked effectively and I had zero complaints!! Until next Birchbox review!! I know but I am Birchbox ACE which allows me to go ahead and reserved my box choice ahead of "regular" subscribers!! The moment that I saw these special Edition boxes I knew I had to get it and pass on the regular April box!! I was going to pick this box! I was so tempted especially since it has a Anastasia product. Don't you just heart Birchbox?!? I got a Whish shaving cream one time and I didn't like it. But I love getting some new things to try at a trial without paying full price! Once in a while there will be a sample that doesn't fit my description for whatever reason, but I am happy about Birchbox sample service! Who doesn't love a goodie box?! This is my first experience using Anastasia products after hearing so many great reviews!! What amazing products you got there! I love the packaging of the box too, it's so fun and very spring. Thanks for sharing. I think I need to re-sub to birchbox again. They've improved so much since I unsubbed from the service. They just keep getting better and better!! I love Birchbox and I will keep my comments as honest and helpful as possible to my viewers!! I had my concerns about the shade ( I would have naturally chosen pink shade) but I love the results without being too orange in color but coral pink shade instead! You got some amazing products! I got the Whish and Beauty Protector as well! A little bit goes a long way with these products!! Great products you lucky thing!! Thanks...just glad that it didn't get "Sold Out" by fellow Birchbox Aces! I love how you told a story with your use of the products! I'm glad the brow gel and blush held up! Hope you had a great time! People remember stories esp. good stories of how a product(s) help them in particular moment...instead of going to the drugstore or Target spending $25 - 30...BOOM $10 Birchbox for getting ready for Second Chance Prom!! Great box! I still would love that Cargo blush. Thank you for your response, Allison!